Visible RFID - Visibly smart! Written data in IC Chip becomes visible without reader/writer. This is the most featuring point of AIOI’s Smart Tag.Up to the present, information in the RFID that cannot be seen has become visible and application can be diversified. Since the device can be read and rewritten through touch-and-go, which is the feature of Felica, operation flow will not be disturbed. 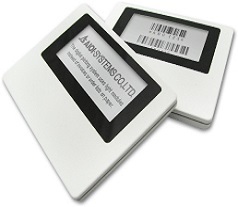 Smart tag uses electronic paper and needs no power consumption while information is being retained except the read and rewritten moment. Moreover, one of the concept of development is to eliminate consumption and disposal of paper label to achieve recycling society.